DOTPhysicalDOCTORS website launched June 2013. Since then we’ve helped hundreds of thousands of drivers find a driver friendly™ FMCSA Certified DOT Doctor. 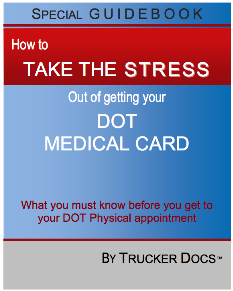 There are many free resources available on this website to help you take the stress out of getting your DOT medical card. Make sure you check them out and save yourself from the pitfalls that could cost you lost time, lost money, or maybe even losing your job. The DOT Physical DOCTORS on this website have been qualified and specially selected to ensure that they understand the professional driving industry… and that they will take care of you personally and make sure that you are evaluated fairly and appropriately. Read reviews from drivers on each doctor’s office webpage. Our story began more than ten years ago in Salt Lake City, UT. Chiro Stop, which offers DOT physical exams, is located at Sapp Bros. truck stop, just off I-80, in Salt Lake City. The resident doctor at Chiro Stop has become fondly known as “Trucker Doc”. Many over-the-road drivers plan their route so they can come through Salt Lake to get their medical card renewed. Word of mouth got the phone ringing off the hook with drivers and safety managers calling and asking DOT physical questions. So Chiro Stop put up a website – DOTPhysicalUtah.com – to help drivers and companies, and answer questions through an FAQ page. Then Chiro Stop started getting calls from all over the country, wanting to know if there is a DOTPhysical office in their state. DOTPhysicalUtah.com became the springboard to DOTPhysicalDOCTOR.com. We’re here to serve commercial drivers, from coast-to-coast, in all 50 states. And “Trucker Doc” has become Trucker Docs™, a dynamic panel of independent doctors bringing expert information to the driver community. Find a driver friendly™ doctor near you! 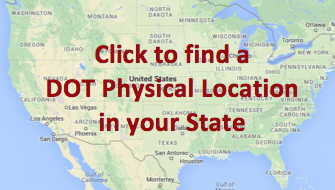 DOTPhysicalDOCTORS represents all 50 states, so if you’re a commercial driver please bookmark the Find A CME page. Then locate the specific state pages that will be most useful to you, and bookmark those too. Please return often as we’re growing our list of “driver friendly™” DOT Physical locations. To learn more about how to use this website, start here. Please tell other drivers about us too! And, if you have a DOT doctor you like, and would recommend to other drivers, please encourage that doctor to join our CMEs. We appreciate your help! We answer questions that no-one else does. Confused? Lied to? Your job in jeopardy? Get straight answers from Trucker Docs™. Our Driver Q&A section is divided into categories to help you find answers quickly. Check out our BLOG and stay updated with news and views of doctors and truckers alike. If you’re a DOT doctor… and you are certified on the National Registry… and you provide a “driver friendly™” environment… here’s where you can get more information about becoming a Premier Member of DOTPhysicalDOCTORS. Get your business page set up now, so drivers can find you.